In today’s chapter, Paul continues his encouragement to the followers of Jesus in Corinth to be generous. Paul was specifically asking them to give to an offering that was being collected to support impoverished fellow believers in Jerusalem. Paul wanted all believers in Greece and Asia Minor to give so to help their fellow believers in Palestine and it was a significant personal undertaking that had social as well as economic implications. If believers in the “gentile” world gave to the predominantly Jewish believers in Judea then it could only help tear down the walls and prejudices between the two groups. Yesterday morning Wendy and I were discussing Paul’s encouragement to generously give to their fellow believers in need. Our conversation deepened from the subject of yesterday’s blog post on generosity to the section of Paul’s letter about equality. Paul argues that those in plenty should give to those who have little so as to bring a level of equality between all. The conversation between Wendy and me quickly meandered into the fact that the early church is often seen as a shining example of socialism. Based on the evidence, there is no doubt that the followers of Jesus in the first century, connected by a common faith, supported one another financially and were encouraged to do so. As our conversation progressed, Wendy and I surfaced what I believe are some important distinctions in the contemplation of today’s chapter. The giving and sharing among early Christians was not uniform system but an organic one. It looked very different in varying locations and times. During my life journey I’ve personally become weary of the way our culture (the institutional church in particular) loves to turn everything into a repeatable, marketable formula. We love to try and package what Holy Spirit did at church A and market it in a cool new program so that churches B through Z can easily replicate the experience. It usually creates popularity but I rarely see it result in a replication of spiritual power. I’ve learned that there’s a reason why God gives us wind as a word picture of Holy Spirit. Holy Spirit mysteriously blows here and quickly moves there. Holy Spirit waxes for a time in one place then inexplicably wanes. You cannot manufacture it or replicate it at will as much as we try. Paul’s offering was never made compulsory. Money was not demanded of the believers in Corinth. Rather, they were encouraged to be generous and the decision of what and how much was to be sourced in their own hearts. I find this a critical distinction. In Paul’s paradigm each believer was to give as each believer determined and was led personally by God’s Spirit. Paul certainly gave a full court press of encouragement explaining that generosity was a part of spiritual maturity and provided examples of other believers giving. There were, however, no formulas or discussion of percentages of income. There was no larger governing authority demanding it of the Corinthians, nor were there material consequences to be doled out if they chose not to give. This leads to a final thought. The giving and sharing between believers in the early church happened on a micro-economic level. This was a relatively small societal sub-culture connected to one another by a loose system of communication and a common faith. It wasn’t an authoritative institutional system trying to provide for all of society. There was no governing authority compelling believers to pay a percentage of their wealth and income to be redistributed to others as that particular governing authority determined. My experience is that things which work on a micro-level in small groups, especially things which are spiritual in nature, are rarely successful at being systemized and institutionally applied at a macro-level across society. I hope no one will read what I’m not writing this morning. I am not arguing for or against socialism as an economic or governmental construct. I’m not arguing for or against any economic or governmental system or another. They all have their strengths and weaknesses, and thus we experience the never ending debate around our globe. The conclusion my heart is coming to this morning is this: As a follower of Jesus, no matter what the societal economic system I find myself living in, generosity is an essentially spiritual act. My free choice and willing decision to give of what I have been given to others in need is, and should be, an act of loving kindness. What’s more, as a follower of Jesus the measure to which I give should be personally motivated by the measure of love and grace I have received from Christ Jesus. As soon as my generosity becomes compulsory, it becomes something else. Driving through the fields of Iowa yesterday I paid special attention to the fields. Dry weather has caused the corn to prematurely turn to a golden brown. Many of the other crops maintain a deep green hue while the tall corn has turned a golden brown. The contrast of color and texture is striking in the hot September sun and cloudless sky. Make no mistake, the corn fields are dense with corn. There appears to be little or no room between stalks and rows. Over the years, agricultural technology has helped farmers maximize the amount of corn they can successfully grow per acre in order to maximize their harvest yield. 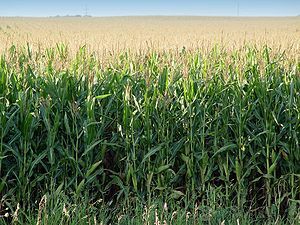 The Iowa Corn Growers Association estimates that Iowa farmers will harvest 2.45 billion bushels of corn this fall across just under 14 million acres. Contrast that with one friend of mine, a self-described “gentleman farmer,” who shared with me last week about the tiny patch of corn he planted in his back yard. His harvest was a paltry few ears of corn that had already been half eaten by deer. Contrasting the Iowa Corn Growers with my Gentleman Farmer friend, I have a perfect visual illustration of the word picture Paul used in his letter describing the truth about financial generosity: “Plant a little, harvest a little. Plant a lot, harvest a lot.” When we give our money to those in need, the amount of good that others harvest from our gift is in direct proportion to the amount of money we have planted in their hands. We can all give more.